Die durchschnittliche Lebensdauer einer physiologischen Wahrheit ist drei bis vier Jahre. The average lifespan of a physiological truth is three or four years. I suspect that the changes that have taken place during the last century in the average man's fundamental beliefs, in his philosophy, in his concept of religion. in his whole world outlook, are greater than the changes that occurred during the preceding four thousand years all put together. ... because of science and its applications to human life, for these have bloomed in my time as no one in history had had ever dreamed could be possible. In The Autobiography of Robert A. Millikan (1951, 1980), xii. 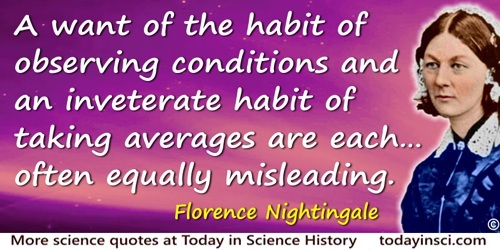 If we betake ourselves to the statistical method, we do so confessing that we are unable to follow the details of each individual case, and expecting that the effects of widespread causes, though very different in each individual, will produce an average result on the whole nation, from a study of which we may estimate the character and propensities of an imaginary being called the Mean Man. 'Does the Progress of Physical Science tend to give any advantage to the opinion of necessity (or determinism) over that of the continuency of Events and the Freedom of the Will?' In P. M. Hannan (ed. ), The Scientific Letters and Papers of James Clerk Maxwell (1995), Vol. 2, 1862-1873, 818. In this generation, along with the dominating traits, the recessive ones also reappear, their individuality fully revealed, and they do so in the decisively expressed average proportion of 3:1, so that among each four plants of this generation three receive the dominating and one the recessive characteristic. 'Experiments on Plant Hybrids' (1865). In Curt Stern and Eva R. Sherwood (eds. ), The Origin of Genetics: A Mendel Source Book (1966), 10. In The Restaurant at the End of the Universe (1980, 2005), 142-143. Slightly revised from 'Fit the Fifth', The Original Hitchhiker Radio Scripts (1985), 102. The show was recorded for the BBC on 21 Feb 1978. It usually takes me from five to seven years to perfect a thing. Some things I have been working on for twenty-five years—and some of them are still unsolved. My average would be about seven years. The incandescent light was the hardest one of all: it took many years not only of concentrated thought but also of world-wide research. The storage battery took eight years. It took even longer to perfect the phonograph. Mathematical knowledge is not—as all Cambridge men are surely aware—the result of any special gift. It is merely the development of those conceptions of form and number which every human being possesses; and any person of average intellect can make himself a fair mathematician if he will only pay continuous attention; in plain English, think enough about the subject. 'Science', a lecture delivered at the Royal Institution. The Works of Charles Kingsley (1880), 241. My experiments with single traits all lead to the same result: that from the seeds of hybrids, plants are obtained half of which in turn carry the hybrid trait (Aa), the other half, however, receive the parental traits A and a in equal amounts. Thus, on the average, among four plants two have the hybrid trait Aa, one the parental trait A, and the other the parental trait a. Therefore, 2Aa+ A +a or A + 2Aa + a is the empirical simple series for two differing traits. Letter to Carl Nägeli, 31 Dec 1866. In Curt Stern and Eva R. Sherwood (eds. ), The Origin of Genetics: A Mendel Source Book (1966), 63. Oddly enough, eccentrics are happier and healthier than conformists. A study of 1,000 people found that eccentrics visit a doctor an average of just once every eight years, while conformists go twice a year. Eccentrics apparently enjoy better health because they feel less pressured to follow society’s rules, said the researcher who did the study at Royal Edinburgh Hospital in Scotland. Eccentrics (1995).Study results in SELF magazine - 1992 National Enquirer. Scientific studies on marine reserves around the world show that if you close a place to fishing, the number of species increases 20 percent, the average size of a fish increases by a third, and the total weight of fish per hectare increases almost five times—in less than a decade. The determination of the average man is not merely a matter of speculative curiosity; it may be of the most important service to the science of man and the social system. It ought necessarily to precede every other inquiry into social physics, since it is, as it were, the basis. The average man, indeed, is in a nation what the centre of gravity is in a body; it is by having that central point in view that we arrive at the apprehension of all the phenomena of equilibrium and motion. The Astonishing Hypothesis: The Scientific Search for the Soul (1995), xiii. Your average scientist is not a good PR person because he wants to get on with his science. On BBC website, 'Climate change scientists losing “PR war”' (11 Feb 2010).